HBCA was founded in 1992 by a group of HBCU alumni employed in and around New London, CT. The groups goal was to promote higher education with an emphasis on HBCUs. Our most popular activity is the annual Historically Black college tour conducted each year during NLHS April break. Students of all nationalities are welcome. The 27th annual Historically Black College tour will feature visits to Howard Univ, Morgan State, Winston Salem State Univ, North Carolina A&T State University, Shaw University, and University of NC - Chapel Hill. Departing from New London, CT on Sunday 4/14 and return on Friday 4/19. The cost is $325 per student and includes chartered coach transportation and hotel accommodations. Students not living in New London County will be charged an additional fee. The fee for students outside of NL County is $400. This is not true. The tour and all programs are open to any students. Our members do not discriminate. Students of all nationalities in the New London area has participated in this program. The inception of this program came about when members discovered young people in the area had no knowledge of HBCUs. In actuality the school system was being exclusive by not carrying HBCU catalogs in their library. The tour schedule include one Traditional White University. Prior to the tour we conduct a college seminar attended by local colleges, which all are predominately White. 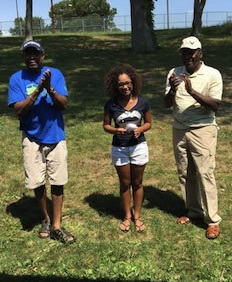 Dr. James Mitchell and HBCA President Vouise Fonville pictured left during HBCA's Family Day Cookout held on August 1, 2015 at Bates Woods Park, New London, CT. Dr. Mitchell presented Lillian James with the 2015 Morrill Scholarship in the amount of $500. Ms. James is a graduate from New London Science & Technology Magnet High School and will be attending the University of Connecticut in the Fall 2015. For details on how to apply to HBCA's scholarship application click here. HBCA members received local and national recognition for outstanding community service. On October 23, 2015 HBCA's president Vouise Fonville was recognized by 100 Men of Color during a Black Tie Gala in Hartford Connecticut. On November 1, 2015 HBCA's Vice President Ray Malone received the Role Model Award by the Newport County NAACP. In February 2016 Sandra Richardson, Secretary was selected as a Daily Point of Light honoree. The Daily Point of Light Award celebrates the power of an individual to spark change and improve the world. On April 29, 2016 Ray Malone received the Men Who Make A Difference Award by the Newport Women's Resource Center. 2019 college tour group pose during campus tour on the 27th annual tour. View photo gallery. Masophia Gabriel is a Haitian-American woman reigning from the rose city, Norwich, CT. She was born January 18 and went to Norwich Free Academy for her 4 years of high school and attended the college tour during her Senior year where she visited Shaw University in Raleigh, North Carolina. She decided to attend Shaw University after graduating in 2015. Her major is Social Work with a concentration in mental health. She plan on attending Winthrop University for my Master of Social Work degree in the fall 2019 to become a cognitive behavioral therapist. 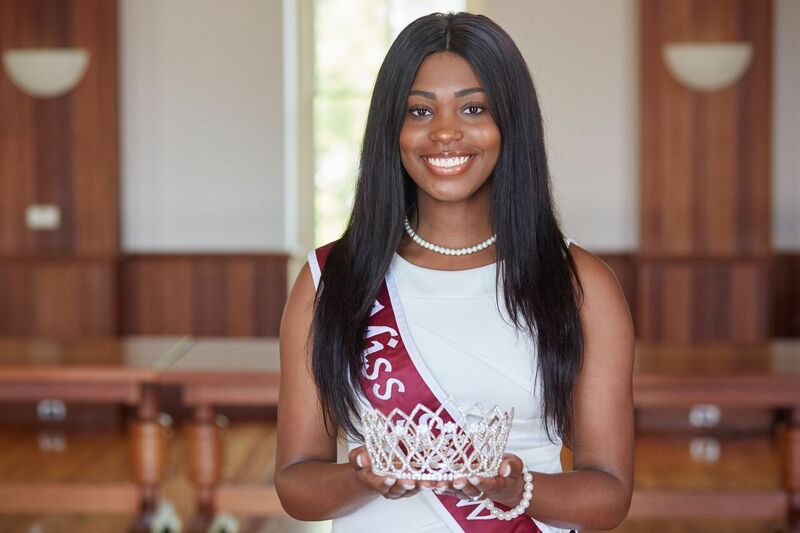 Throughout her matriculation at Shaw University, she have been a deans list student, a proud member of the Beta Rho chapter of Alpha Kappa Alpha Sorority, Incorporated and the reigning Miss. Shaw University 2018-2019.